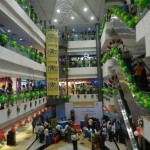 Vishaal de Mal is a shopping mall in the city of Madurai. This mall covered up mostly all the branded showrooms followed by coffee shops,multiplex theatres,and departmental stores. LEVEL G: Malabar gold and diamonds,PepeJeans,Derby,Woodlands,Maggica,Odessey,Party hall,Blooming flowers,Scoopp,Ashish Mehandhi art. LEVEL 3: Archies,Cool Colors,Stylo,Blush,Jockey,Mamta Fomra,Rayban Sunglasses,Shen’s Farm,Jill Jill Boutique.